Abkhazia: Does Rising Crime In Pose A Threat To Russia? (RFE/RL) — Russian President Vladimir Putin’s visit to Georgia’s breakaway Republic of Abkhazia in early August served to highlight once again Moscow’s uneasy and difficult relationship with that particular client. Nine years after Russia (and virtually no one else) formally recognized Abkhazia as an independent state, rising crime there could pose a potential threat both to Moscow’s long-term interests in that republic and to the nearby Russian town of Sochi, one of the venues for next year’s FIFA World Cup. Russia’s primary interests in Abkhazia are threefold. The first is military-strategic and centers on the recent formation of the Russian-Abkhaz Joint Group of Military Forces based in Gudauta. 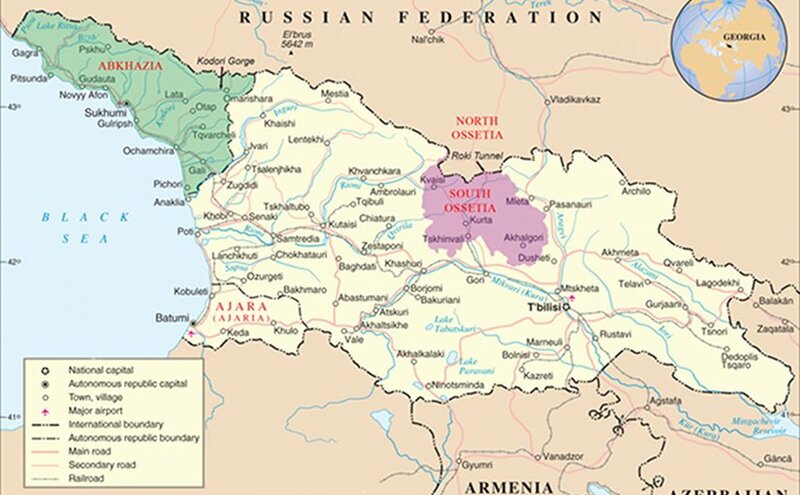 The stated rationale for that Russian military presence is to protect Abkhazia against possible aggression from the rest of Georgia. The international community regards it as a violation of the terms of the agreement that ended the war of August 2008. To that end, as commentator Anton Krivenyuk points out, Moscow has provided the maximum political support for successive Abkhaz leaders as long as their position was tenable, and then switched overnight to supporting the successor. That support is not, Krivenyuk says, based on the merits of the man in question but on his status as head of state, insofar as Russia has a vested interested in the political process in Abkhazia being perceived as legitimate. The process of transformation into a modern, economically viable state is proving an uphill struggle, however. The generous financial aid Moscow has provided over the past nine years has failed to kick-start Abkhazia’s moribund economy or substantially reduce unemployment, currently estimated at 70 percent. The Abkhaz government, while aware of the urgent need for further investment, is wary of the possible negative effects of an influx of Russian money, and steadfastly refuses to enact legislation that would enable foreigners to purchase real estate. At the same time, violent crime, such as armed assault and robbery, has risen steadily, fueled by unemployment and also reportedly by widespread drug-addiction among unemployed and disadvantaged young males. The police force is variously perceived as either powerless to cope with that upsurge in crime or more interested in augmenting their meager salaries by fines from motorists for nonexistent infringements of traffic regulations. Former Interior Minister Raul Lolua, now an opposition parliament deputy, said recently that of every 400 crimes committed, only 20 ever result in a trial. Even Khajimba was forced to concede last year that despite a reported increase in the number of crimes solved, the situation was by no means as rosy as official statistics suggested. That upsurge in crime has begun to affect tourism from Russia, traditionally a major source of income and on which Khajimba pins hopes for an economic upswing. Russia’s rapprochement with Turkey means that country is again the destination of choice for many Russian tourists; consequently the number of Russians visiting Abkhazia in May-July 2017 was 30 percent lower than last year, when the number had reached 1.1 million by early September. What is more, many Russians who had planned to travel to Abkhazia this summer have canceled their vacations following the murder last month of one Russian tourist and an attack on a second visiting Russian family. Two Russian tourists were also killed earlier this month, and some 30 injured in an explosion at an arms depot in Gudauta. Following his talks with Khajimba, Putin announced that Moscow will invest 6 billion rubles ($101 million) in Abkhazia between now and 2019. He did not, however, give any indication whether there will be any increase in direct financial aid, which was cut this year to 2.58 billion rubles from 7.7 billion in 2016. At the same time, Russia will contribute to funding the planned joint “Information-Coordination Center” to spearhead the fight against organized cross-border crime, in particular drug trafficking.